I have acquired a consuming hobby over the last year; beading. It is a most excellent passtime in which I indulge when gardening is unavailable due to season or weather or circumstance. This bezel pendant is actually the first item I made. I just had to go all-aboard first time round. I made one for myself, my Mum, my niece and her Mum. Then I ran out of the 24mm purple pearls I used for the base. My niece will have to wait for hers, as she is still at that age where she has to put everything in her mouth. 24mm wax pearl base. 6/0 and 9/0 Czech beads, 8/0 and 9/0 Tohos, and 11/0 Miyuki delicas. Czech drop crystal. 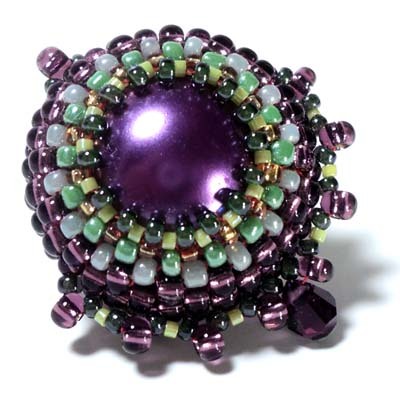 Purple bead thread. Even count peyote stitch.